Britain Today, Tonight is a British 30 minute scripted comedy television series, which kicked off on May 5, 2017, on Channel 4 and is broadcast every Friday at 22:00. The show is currently in its 1st season. Channel 4 is yet to announce the renewal of Britain Today, Tonight for Season 2 as well as its cancelation. Sign up to track down the show's status and its release date. A spoof tabloid 'news show' that promises to shine a light on contemporary Britain. 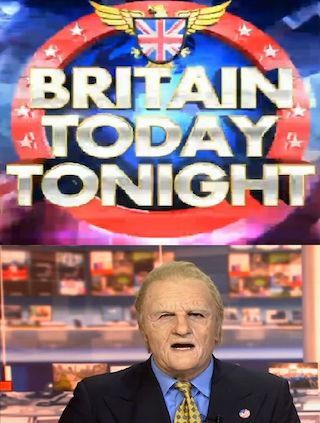 But with Kayvan Novak playing the part of the American anchorman, the reporters and even some of the subjects of the reports - this is the 'news' as you have never seen it before. He'll be disguising himself as a range of weird and wonderful personalities in order to perform a range of hidden camera hits on celebrities and politicians, as well as winding up the public at large.